The prophets emphatically declared that wicked and arrogant Babylon would fall. The immediate fall, and ultimate deterioration, would come after the Hebrews had languished seventy years in Babylonian captivity. It might be advantageous if the reader were to review that material before proceeding with the current presentation. In this article, a number of particulars that are reflected prophetically in the biblical records will be highlighted. The works of Herodotus and Xenophon are the two principal sources of historical confirmation. Herodotus (484-425 B.C. ), known as the “father of history,” produced the first attempt at secular narrative history. His work, which dealt primarily with the Persian Wars, is an important source of information on the ancient world. He vividly describes the overthrow of Babylon. Xenophon (ca. 430-355 B.C. ), a student of Socrates, was a Greek historian born in Athens. He served in the Persian army and produced several valuable literary works. One of these, called Cyropaedia, is a sort of romance founded on the history of Cyrus the Great (559-530 B.C.). It provides considerable data on the fall of Babylon. As this writing is composed, the author has copies of both these volumes before him. Again, we emphasize that one of the traits of true prophecy is that it deals in specific details, not generalities. Let us examine some of these particulars. Babylon had been a brutal force. She was “the glory of the kingdoms” (Isaiah 13:19). She had been Jehovah’s providential “battle-axe” that had broken in pieces the nations of the ancient world (Jeremiah 51:20-24). For example, Nebuchadnezzar had defeated thoroughly the Egyptians at the battle of Carchemish (605 B.C. ), and had enjoyed great success in Syria and Palestine, even subjugating “Zion” at the Lord’s bidding. The mighty men of Babylon have ceased fighting. They stay in the strongholds; their strength is exhausted, they are becoming like women (51:30). How remarkably this conforms to the actual history. Xenophon said that when Cyrus brought his army to Babylon, he initially was perplexed as to how he would take the city, since the Chaldean soldiers “do not come out to fight” (Cyropaedia VII.V.7). The Babylonians fearfully remained behind their massive walls refusing, for the most part, to encounter the enemy—exactly as the prophet had indicated. When Cyrus surveyed Babylon’s fortifications, he said: “I am unable to see how any enemy can take walls of such strength and height by assault” (Ibid., VIII.V.7). Accordingly, he devised a brilliant strategy for capturing the city. As was mentioned in our previous essay, the Euphrates river ran under the walls through the center of Babylon. From the river, canals—quite broad and sometimes navigable—were cut in every direction. The Jews in captivity could thus lament: “By the rivers of Babylon, There we sat down, yea, we wept, When we remembered Zion” (Psalm 137:1). Just to the west of the city was a huge lake-basin, some thirty-five feet deep and covering forty miles square, but which, at the time of the invasion, was but a marsh. Cyrus stationed soldiers at the point where the river entered the city, and also where it exited. At a given time, he diverted the Euphrates from its bed into the marshy lake area. His forces then entered Babylon under the city walls (Herodotus, The Histories I.191). saith to the deep: Be dry, and I will dry up thy rivers, that saith of Cyrus, he is my shepherd and shall perform my pleasure (44:27). Some contend that the language of this passage is an allusion to the Exodus, which occurred in Israel’s early history. That cannot be the case, however. The utterance is framed in the future tense, and the context specifically relates this matter to Cyrus. The prophecy “is usually taken as referring to the device Cyrus used in order to capture Babylon” (Fitch 1954, 593). Later, in his famous oracle against Babylon, Jeremiah exclaimed: “A drought is upon her waters, and they shall be dried up: for it is a land of graven images, and they are mad over idols” (50:38). Again, “I will dry up her sea, and make her fountain dry” (51:36). Though these passages have been variously interpreted, the language is quite consistent with the diversion of the river, which allowed the Persians to take the city virtually unopposed (Wiseman 1979, 849). Had the Babylonians been apprised of what Cyrus was about, or had they noticed their danger, they would never have allowed the Persians to enter their city (The Histories I.191). When they are heated, I will make their feast, and I will make them drunken, that they may rejoice, and sleep a perpetual sleep, and not wake, says Jehovah (Jeremiah 51:39). And I will make drunk her princes and her wise men, her governors and her deputies, and her mighty men; and they shall sleep a perpetual sleep, and not wake, says the King whose name is Jehovah of hosts (Jeremiah 51:57). Herodotus recorded that the citizens of the central section of the city did not know that Babylon had fallen for a good while because “they were engaged in a festival, continued dancing and revelling until they learnt the capture” (Ibid., I.191). Similarly, Xenophon said that “there was a festival in Babylon, in which all the Babylonians drank and revelled the whole night” (Cyropaedia VII.5.15). The prophets indicated that when great Babylon was taken, her rich treasures would be looted. The Lord, speaking prophetically to Cyrus, had promised: “[A]nd I will give you the treasures of darkness, and hidden riches of secret places” (Isaiah 45:3). Jeremiah announced: “[A]nd they shall become as women: a sword is upon her treasures, and they shall be robbed” (50:37). The treasures of Babylon were splendid beyond description. Herodotus, in describing just one of the temples in the city, declared that it contained more than twenty tons of gold (The Histories I.183). It is interesting to note that when Cyrus issued his famous decree, allowing the Jews to return to their land, he endowed them with silver and gold to help finance the project, as well as returning some 5,400 vessels of gold and silver that originally had been taken from the Hebrew temple (Ezra 1:4,11). When Jehovah beckoned the Persians to come against evil Babylon, he charged: “[O]pen up her store-houses [granaries, ASV fn]; cast her up as heaps, and destroy her utterly; let nothing of her be left” (Jeremiah 50:26). Xenophon reports that Babylon “was furnished with provisions for more than twenty years” (Cyropaedia VIII.5.13). No wonder they felt secure; the storehouses were bulging. But God emptied them—just as his prophet had announced! We have spoken already of Babylon’s famous walls. An ancient historian, Diodorus, stated that it took two hundred thousand men a full year to construct these fortifications (Fausset 1990, 181). But Jeremiah prophesied: “The broad walls of Babylon shall be utterly overthrown, and her high gates shall be burned with fire” (51:58). Where are Babylon’s walls, and her one hundred gates of brass (Herodotus, The Histories I.179) today? Under the “Summary” below, the demolition of the city will be detailed more precisely. And Babylon, the glory of kingdoms, the beauty of the Chaldeans’ pride, shall be as when God overthrew Sodom and Gomorrah. It shall never be inhabited, neither shall it be dwelt in from generation to generation: neither shall the Arabian pitch tent there; neither shall shepherds make their flocks to lie down there. But wild beasts of the desert shall live there; and their houses shall be full of doleful creatures; and ostriches shall dwell there, and wild goats shall dance there. And wolves shall cry in their castles, and jackals in the pleasant palaces: and her time is near to come, and her days shall not be prolonged (13:19-22). Jeremiah was equally graphic; the reader may consult chapters fifty and fifty-one of his book for the numerous details given there. At this point an item should be re-emphasized that was mentioned in the first part of this series. First, there was to be an initial defeat of Babylon. Second, afterwards there would be a gradual but progressive degeneration of the locale, which would ultimately become a site of absolute waste. In the following section, we will catalogue the destructions and degeneration of once-great Babylon. After a siege of two years, the city of Babylon was captured by Cyrus, commander of the Medo-Persian forces, in October of 539 B.C. This brought the Neo-Babylonian empire (614-539 B.C.) to a close. Significant damage to the city was not inflicted at this time, though some of the walls may have been broken down, at least partially. Thus was Babylon taken for a second time. Darius having become master of the place, destroyed the wall, and tore down all the gates; for Cyrus had done neither the one nor the other when he took Babylon (The Histories III.159). Apparently, however, there was some subsequent repair of the walls (McClintock and Strong 1969, 596). During the reign of Xerxes (485-465 B.C. ), the temple of Bel (Marduk) was plundered and destroyed. Much of the city was turned into ruins in 483 B.C., and the walls were dismantled further. Babylon again fell to Alexander the Great in 331 B.C. As Alexander neared the city, priests and nobles went out to meet him with lavish gifts, surrendering the city. Alexander proposed that he would rebuild the temple of Marduk. He employed ten thousand men to clear the dirt and rubble. They labored in vain for two months. Alexander died and the work was abandoned (Rollin 1857, 575). A clay tablet has been found that confirms this enterprise. It records that in the sixth year of Alexander’s reign, he made a payment of ten manehs of silver for “clearing away the dust of E-sagila [Marduk’s great temple]” (King 1919, 284-288). In 270 B.C. Antiochus Soter, a Greek ruler, restored several of the temples in Babylon, but the general decay of the city continued. In the time of Strabo (at the end of the first century B.C. ), the site was in ruins. Jerome (fourth century A.D.), learned that Babylon had been used as a wild game park for the amusement of numerous Persian dignitaries (McClintock and Strong 1969, 596). In the fifth century A.D., according to Cyril of Alexandria, due to the bursting of canal banks, Babylon became a swamp (Jeremias 1911, 294). Volney, the French atheist who was such a militant adversary of the Bible, wrote his book, The Ruins of Empires, in 1791. Therein he stated: “Nothing is left of Babylon but heaps of earth, trodden under foot of men” (as quoted in Holman 1926, 333). As Jeremiah had prophesied: “(c)ast her up as heaps” (50:26). It is ironic that a skeptic should lend support to confirming the accuracy of the biblical narrative! When Austen Layard explored Babylon in the mid-nineteenth century, he described the heaps of rubbish that rendered the area a “naked and hideous waste” (1856, 413). Later, when Robert Koldewey excavated the city for eighteen seasons beginning in 1899, he said that as he gazed over the ruins, he could not but be reminded of Jeremiah 50:39 (1914, 314). He reported that many of the sites were covered with forty to eighty feet of sand and rubble. A relatively modern air-view of Babylonia—once the world’s greatest city—shows only a mound of dirt and broken-down walls (Boyd 1969, 153ff). 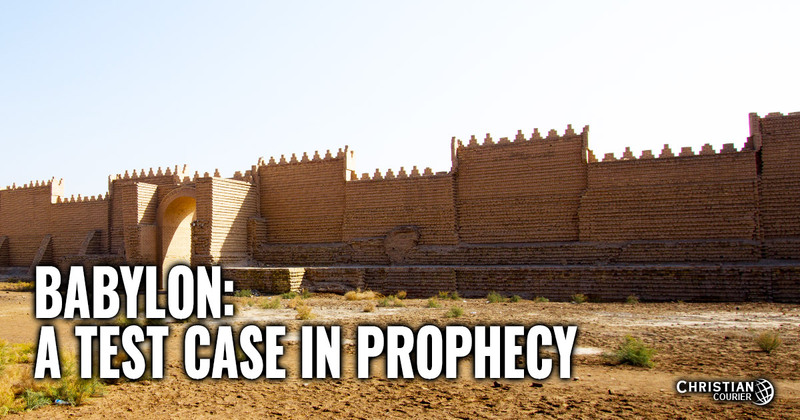 In recent years Sadam Hussein attempted to build a tourist center near the site of old Babylon. The Persian Gulf War seriously impaired his plans. Some of the poems in this present collection seem to reflect the city’s downfall, as prophecies after the event rather than predictions (1956, 1124). Such a view ignores the evidence for dating the books at a much earlier period. Dating chapter 50 is virtually impossible. The arrangement of the text indicates that it was a composite, probably containing materials from different periods. . . The chapter may have reached this form near the mid-sixth century B.C., when the fall of Babylon appeared likely (1987, 309). Upon this basis, then, one supposes that Jeremiah—or whoever put the composite together!—simply made a lucky guess as to the fall of Babylon. Such a view is disgusting, and unworthy of any Christian writer. The prophetic details regarding the fall of ancient Babylon, as minutely recorded in the Old Testament narratives, truly are astounding. This is but another example of the amazing evidence that demonstrates the character of the Bible as the inspired Word of God. Ash, Anthony L. 1987. Jeremiah and Lamentations. Abilene, TX: Abilene Christian University Press. Boyd, Robert. 1969. A Pictorial Guide to Biblical Archaeology. New York, NY: Bonanza. Fausset, A. R. 1990. Jeremiah. A Commentary on the Old and New Testaments. Vol. 2. Robert Jamieson, A. R. Fausset, and David Brown, eds. Grand Rapids, MI: Eerdmans. Fitch, W. 1954. Isaiah. The New Bible Commentary. F. Davidson, ed. Grand Rapids, MI: Eerdmans. Holman, Thomas. 1926. Prophecy Vindicated by Volney. New Testament Christianity. Z. T. Sweeney, ed. Columbus, IN: NT Christianity Book Fund. Hyatt, James Phillip. 1956. The Interpreter’s Bible. George A. Buttrick, ed. Nashville, TN: Abindgon. Jeremias, Alfred. 1911. The Old Testament in the Light of the Ancient East. New York, NY: Putnam’s Sons. King, Leonard W. 1919. A History of Babylonia and Assyria. London, England: Chatto & Windus. Koldewey, Robert. 1914. The Excavations at Babylon. London, England: Macmillan. Layard, Austen H. 1856. The Ruins of Nineveh and Babylon. New York, NY: Harper. McClintock, John and James Strong. 1969. Cyclopedia of Biblical, Theological, and Ecclesiastical Literature. Grand Rapids, MI: Baker. Rollin, Charles. 1857. Ancient History. New York, NY: Harper & Brothers. Wiseman, D. J. 1979. Jeremiah. The New Layman’s Bible Commentary. G. C. D. Howley, F. F. Bruce, and H. L. Ellison, eds. Grand Rapids, MI: Zondervan.